The ISS has gotten quite a few improvements lately, but the latest addition is unusually impressive: a 12-foot long expandable room that astronauts will attach to the space station’s back and inflate to twice its original size. 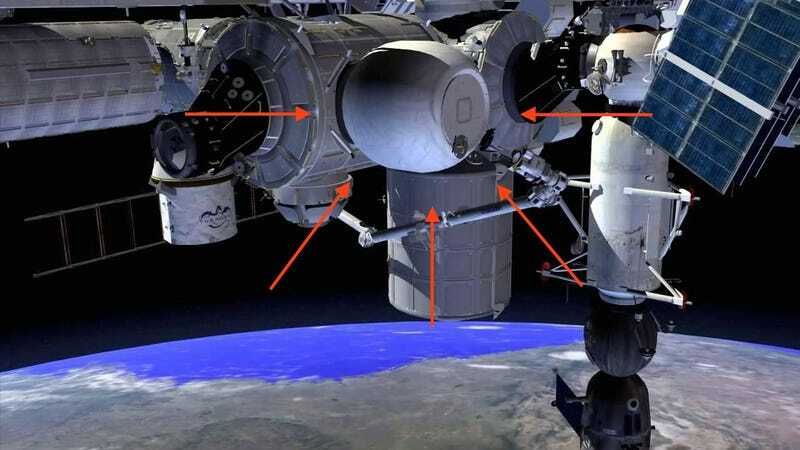 NASA today revealed that the Bigelow Expandable Activity Module (BEAM) will make the trip up on the next resupply mission. Once there, it will be attached to the space station’s rear port using the ISS’s robotic arm, where it will inflate at the touch of a button from its compact size of just over five-and-a-half feet long to its full size. From trigger to full expansion, the process takes only 45 minutes. The astronauts will make a total of four trips into BEAM, the longest of which will go for only three hours. It’s not BEAM that’s forcing the shortened timeframe, however. NASA’s manager for the project Rajib Dasgupta told Gizmodo that the astronauts could easily stay much, much longer if they desired. But with their already busy schedules it’s unlikely that they’ll have time to visit any longer than the already scheduled testing of the unit’s radiation protection, temperature, and general operation. When they astronauts do visit BEAM, they should find it quite similar to the existing ISS. “The difference between the two is very, very minimal,” Dasgupta said, noting that impact durability of the attachable is the same as the existing metallic ISS. The only differences an astronaut might notice, beyond the appearance, would be slightly cooler temperatures and a bit of condensation when it first expands. BEAM will remain attached to the ISS for two years, when the ISS team will jettison it into space—although, BEAM researchers did leave the possibility for an extension open, saying that they had rated it safe for up to five years. The most exciting possibilities for the module extend well beyond the ISS mission. There’s a chance that similar structures could be used for future lunar or martian colonization. Even with a successful ISS run, however, there would still be a long way to go towards modifying expandable houses for deep space life and the additional trials, including tougher potential impacts, dust barriers, and other challenged they’d face on a planetary or lunar surface. Even still, this new technology is another exciting step closer towards sustaining life on Mars.